This entry was posted on October 6, 2016 at 22:38 and is filed under Climate science, English, Scenarios. You can follow any responses to this entry through the RSS 2.0 feed. You can skip to the end and leave a response. Pinging is currently not allowed. Why do you treat the Representative Concentration Pathways as projections of potential realities? They are not. As I’m sure you are aware, they are ad hoc explanations of possible ways the planet could achieve pre-assigned levels of radiative forcing. Those levels were given as a starting point in the exercise to develop inputs to climate models. They are not projections. The researchers have specifically said they are not projections for over a decade. A casual look at the ad hoc explanations they came up with show that they are not at all serious, especially RCP 8.5. Worse, RCP 8.5 has already been invalidated by choices we have collectively made about green energy, emissions control and population. Only those wishing to foster a sense of panic would hold RCP 8.5 out as either a carrot or stick for influencing policy. You wouldn’t do that, would you Bart? TWF: You wouldn’t do that, would you Bart? 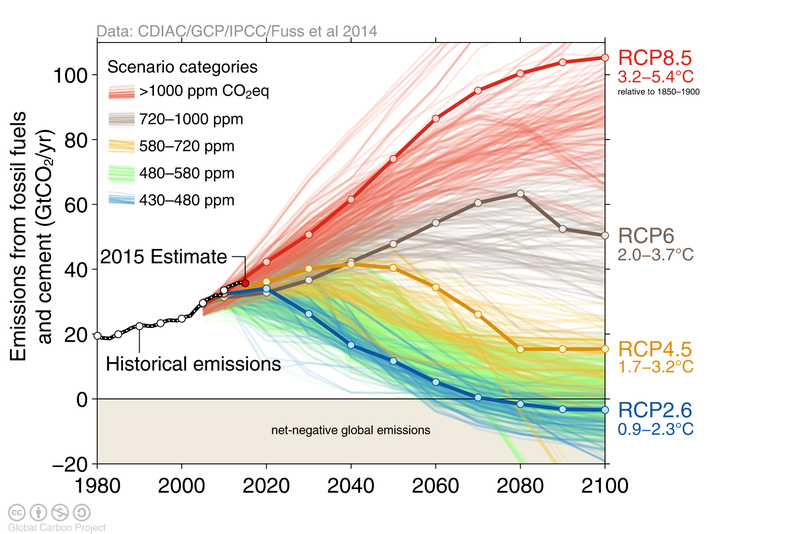 I agree with Thomas here, presenting RCP8.5 as no-mitigation future is an untrue statement. Please come back and tell you didn’t mean this. So it is actually mitigation (“emissions control”) which “invalidates” RCP8.5. By extension, without any mitigation RCP8.5 might be a valid projection — quite possibly even on the low side if one would consider only CO2 emissions. A point of criticism on RCP8.5 is that the net methane emissions are rather high, which impacts CO2-equivalent and it is the reason why the graph shows “>1000ppm CO2eq”. On the other hand, the RCP8.5 scenario already contains some plausible developments which would happen to limit CO2 emissions even without mitigation policies, such as an increasing role for natural gas and nuclear. This paper summarizes the main characteristics of the RCP8.5 scenario. The RCP8.5 combines assumptions about high population and relatively slow income growth with modest rates of technological change and energy intensity improvements, leading in the long term to high energy demand and GHG emissions in absence of climate change policies. The graph of earths temperature over the last two million years is very telling. The peaks of both high and low temperatures show that a change in the energy expended in our atmosphere changed suddenly. It can’t all be caused by human activity because we weren’t around. The trend of movement of the magnetic poles indicate that there is a large change occurring in our planet. Why do the magnetic poles move? The earths core is not solid but flows around a more solid iron core. This movement of the material within the mantle around the iron core generates the magnetic field around the planet. The gigawatts of energy generated expands the magnetic field around the planet and beyond, well into the ionsphere. The plasma-sphere is not really spherical but a doughnut-shaped region (a torus) with the hole aligned with Earth’s magnetic axis. [In this case the use of the suffix -sphere is more in the figurative sense of a “sphere of influence”.] The Earth’s plasmasphere is made of just that, a plasma, the fourth state of matter. This plasma is composed mostly of hydrogen ions (protons) and electrons. It has a very sharp edge called the plasmapause. The outer edge of this doughnut over the equator is usually some 4 to 6 Earth radii from the center of the Earth or 12,000-20,000 miles (19,000-32,000 km) above the surface. The plasmasphere is essentially an extension of the ionosphere. Inside of the plasmapause, geomagnetic field lines rotate with the Earth. The inner edge of the plasmasphere is taken as the altitude at which protons replace oxygen as the dominant species in the ionospheric plasma which usually occurs at about 600 miles (1000 km) altitude. The plasmasphere can also be considered to be a structure within the magnetosphere. The rotation of the geomagnetic field lines in the plasma-sphere in this proton plasma has a feedback effect on the magnetic field of the earth. This feedback results in additional energy applied to the movement of the magma around the earths iron core. The size of the interface between the suns radiation and the plasma-sphere generates an enormous amount of energy that is amplifies the movement of the magma that is generating the magnetic field. The position of the magnetic pole is evidence of the relative speed of the magma. A higher speed results in an offset from the center, just like a field in a generator. With the movement of the magnetic pole towards the center of the earths pole, it is evidence of a slowing magma flow in the earth. This causes a reduction in the magnetic force generating the magnetosphere. The reduction in the magnetosphere force allows further penetration of suns energy into the atmosphere resulting in additional heating of the earths atmosphere. 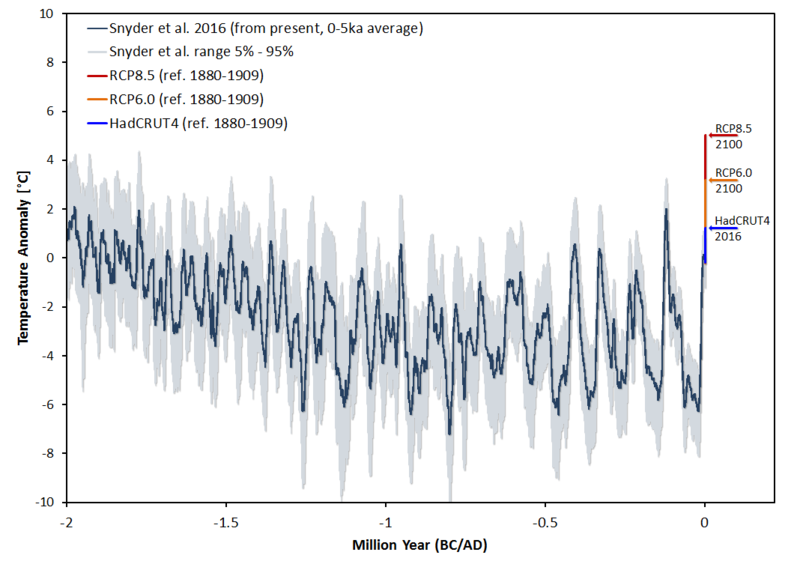 The really interesting thing about the graph of the last two million years of global temperature is the peaks and valleys. I think this indicates that there was a sudden change in magma flow and relative excitation of the earths atmosphere. This can only be caused by volcanic activity. Volcanoes can emit large amounts of water vapor, CO2, and sulfuric compounds into the upper atmosphere. These particles are bombarded by the solar radiation and separated into ions which would add material to the plasma-sphere and cause a change in excitation of the magnetosphere. As I read more about the changes in the magnetic poles, and the corresponding changes in the atmospheric temperatures, it isn’t unreasonable to expect the reduction in magma flow will cause a volcanic eruption cycle to erupt, due to the change in pressure and temperature exerted on the crust by the magma. It looks like we are almost at a peak in temperature so shouldn’t we expect a change in volcanic activity in the next couple of centuries?